Foundations in Accountancy consists of a suite of awards, including certificates, diplomas and a revised Certified Accounting Technician (CAT) Qualification. The Certified Accounting Technician (CAT) is a vocational qualification designed by ACCA that will allow you to support the work of professional accountants. The final – level examinations are equivalent in standard to the first year of a university degree programme. Consequently, the CAT qualification could be your stepping stone to the ACCA Qualification and membership of the global body for professional accountants. Why CAT at KOLEJ SUNWAY KUCHING? A Parents – Lecturers’ Day is held once every semester. On this day, parents are able to discuss with lecturers the progress of the students. To date, the response has been positive, fostering good rapport between parents, students and lecturers. Most students graduate in one year. The first 7 papers are computer-based exams. Exams for optional papers are paper-based. The students who attempt the computer-based exams are able to obtain their results immediately upon completion of the examinations. Paper-based exam results will be released within 2 – 3 months. 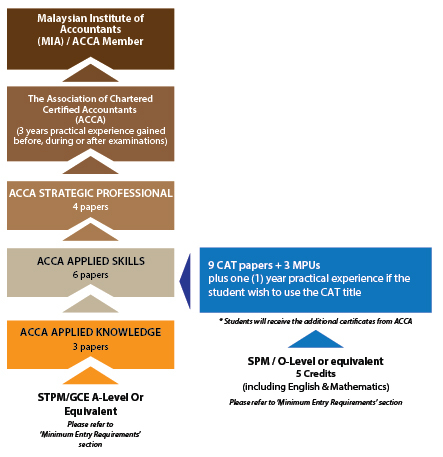 Graduates with one year relevant and supervised practical experience are required to submit their Practical Experience Requirement which may be pre-, during or post-examination / studies to ACCA. Upon approval, CAT graduates may add the prestigious designatory initials ‘CAT’ to their names. CAT graduates will be able to support Accounting and Finance functions in any type of business, both locally and internationally.